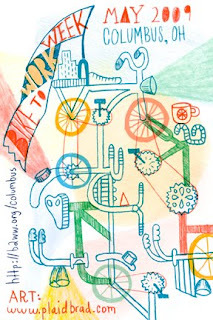 I was contacted way back in December/November of 2008, by the good folks at http://b2ww.org/columbus to do some artwork for their "Bike to Work Week" event(s) for the month of May. Originally we had planned on doing a poster, a t-shirt, and a spoke card; however, the project got chopped down to just the spoke card, which you see above. I wanted to post this because I am not actually sure if these were produced or not, but I really liked how it turned out regardless. *side note: they actually contacted me because they liked the bike in my desktop wallpaper I did for Bobby Solomon's awesome blog Kitsune Noir. This is awesome! Go Brad GO!